just up the pike: where do MoCo's car-free residents live? where do MoCo's car-free residents live? Like many suburban communities built after World War II, Montgomery County developed based on the assumption that everyone would have a car. However, many households have just one, or none at all. While some are in the county's urban centers, a surprising number are in very car-dependent places. Where car-free residents live. All images by the author. 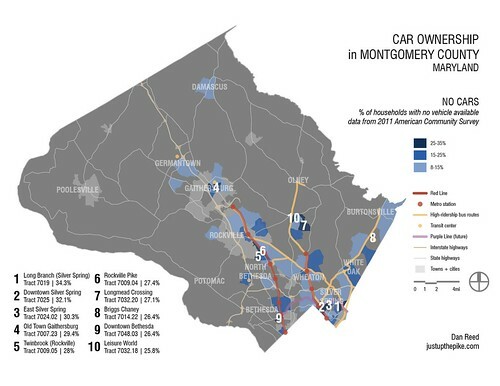 According to the 2007-2011 American Community Survey, a sort of annual census, there are over 374,000 households in Montgomery County, and 91.8% of them have cars. That's not surprising for a largely affluent suburban county, where many people own cars simply because they can. Growing up, I had several friends whose parents raced sports cars, but never drove them on the street. But car ownership countywide is slightly lower than in 2000, when 92.5% of all households had cars. Today, more than 2 out of 5 households have one car or no car. Like transit riders and young adults, those households are concentrated in certain areas, which can give us insight on where to make it easier to get around without driving. Just 8.2% of the county's households have no car, and you'll find many of them near transit. 5 of the top 10 largest concentrations of car-free households are near Metro stations. Over 30% of all households in Silver Spring and 28% in Twinbrook are car-free. Some concentrations are in older, walkable areas with good bus service, like Long Branch, where over 1/3 of all households have no car. As a result, Long Branch has high transit ridership. There are also many car-free households in newer suburban areas like Briggs Chaney, where they make up a quarter of the population, and even Germantown and Damascus, where 10% of all households are car-free. These communities have winding, disconnected streets, which can make walking very dangerous and good transit service nearly impossible. One-third of all county households have one car, a slight decrease from 2000. Like those with no cars, these households are concentrated along major bus routes and in retirement communities. As before, Briggs Chaney and Leisure World top this list. Where households with one car live. But there's also a lot of one-car households along near Red Line stations in Bethesda and Chevy Chase. Nearly 2/3 of downtown Bethesda households have one car, but relatively few have no cars at all. This suggests that many Bethesda residents move downtown to have amenities within walking distance, but bring a car anyway. There are also large concentrations of one-car households along I-270 and Rockville Pike, which appear to coincide with activity centers like White Flint and Washingtonian Center in Gaithersburg. These are places that might support a "car-lite" lifestyle: they have some walkable areas, and in the case of White Flint, a Metro station. 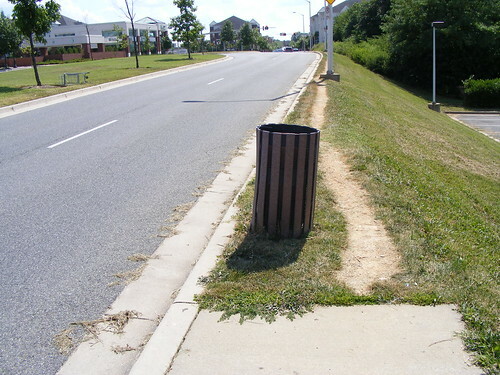 But for now at least, they're not dense or pedestrian-friendly enough to leave the car at home all the time. Almost 40% of Montgomery County households have two vehicles, and 19% have three or more. But where they live is almost the inverse of where no-car and single-car households are located. Two-car households seem to form rings around the county's Metro stations and activity centers. Many of them are concentrated west of I-270 and in further-out communities like Olney and Clarksburg. Where households with two cars live. But 3 of the county's largest concentrations of two-car households are in close-in areas, like Four Corners in Silver Spring and Chevy Chase Village. Four Corners especially sticks out, as car ownership rates are generally lower in East County, and it's a pretty walkable area served by two major Metrobus lines. Where households with three cars live. Meanwhile, three-vehicle households are largely confined to the county's Agricultural Reserve and other rural areas. Those third vehicles probably aren't being used for commuting, but for hauling supplies or produce. The concentrations of car-free or car-lite households in places like downtown Silver Spring or downtown Bethesda show that Montgomery County's efforts to build around transit have encouraged people to drive less. But for the county's growing number of low-income households, going car-free isn't a choice. Places like Germantown and Briggs Chaney are more affordable, but without good transit or walkable neighborhoods, their residents are basically stranded far from shopping, social services, and most importantly jobs, which restricts their economic mobility as well. A dirt path in Germantown. Many car-free people live in places where it's hard to get around without a car. How can we fix this? Part of the answer will come in the redevelopment of places like White Flint, which will result in some affordable housing, giving low-income households a chance to live in a place redesigned for walking, biking and transit. But we'll also have to figure out how to provide better transit and better walking conditions in the neighborhoods where people already live. One solution could come from the county's Bus Rapid Transit plan. While planners' vision for a network of countywide BRT lines has serious flaws, it does propose improved transit service along corridors where car-free households already live, like Rockville Pike and Route 29. Most Montgomery County households have cars, and will probably continue to for the foreseeable future. But we still have to make room on our streets for the growing number who don't. Wow. Blogger gobbled my comment. It must have been a bad comment. I accept this as a legitimate analysis of cause and effect. 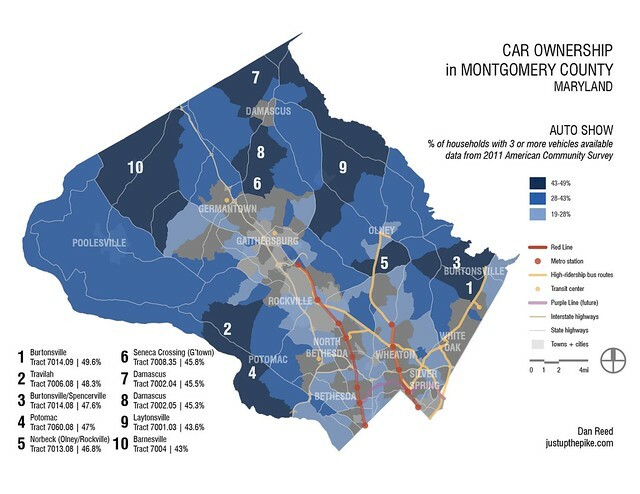 Good post; I always read you with some suspicion on transit and development, Dan, because my pet peeve about the data you've collected and reported here is that it shows that over 90 percent of MoCo households own cars. Your acknowledgement of reality pleases me. We do unequivocally owe it to pedestrians and transit users to improve safety and availability. We do owe it to our children to reduce private vehicle ownership and use (non-coercively). For now? 90 percent of us own (or have a stake in) cars. I'd like to see us, as a community, reduce friction and suspicion between transit users/pedestrians and private vehicle owners. Transit and pedestrians and private vehicle ownership can co-exist, and MoCo is a place where they should. We're that good, period.